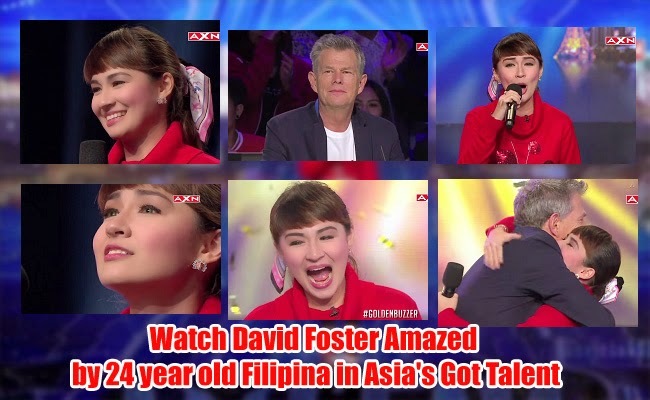 A 24 year old Filipina finally convinced Grammy-winning composer David Foster to press the golden button and give her the instant ticket to Asia’s Got Talent semifinals. Gerphil Geraldine Flores was able to get into the semi-finals after she had impressed the judges on April 9 episode. Gerphil Geraldine Flores performed"Speak Softly, Love" by Andy Williams' as her audition piece. Performing "The Godfather" trilogy theme, she made people get up on their feet and cheer for her in a standing ovation including the four judges, Taiwanese-American pop idol Vanness Wu, Indonesian rock icon Anggun, former Spice Girl Melanie C and David Foster. After the performance, Canadian music producer , Foster shared to everyone that her rendition is something that he had been looking for. He then told the artist that nobody got disappointed with her. He then described it as a solid performance with great pitch. She was never out of tune and he hated people who sing out of tune. Each judge is given just one chance to press the golden buzzer that sends the fortunate talent in audition rounds to go straight to the semi finals. Foster was the only one who hadn’t yet use this opportunity and decided to give the shot to Flores who was surprised too. Flores had also once joined a talent search in the Philippines’ "Pilipinas Got Talent,"and finished in semi finals of the show in 2010. As of the latest episode, there are 13 Filipino acts that were able to pass the auditions including Flores, Gwyneth Dorado, El Gamma Penumbra and The Velasco Brothers.